The 30-year-old Thoroughbred gelding is a graying bundle of contradictions. He has a lip tattoo, yet he never made it to the starting gate. He adores his paddock-mate Charlie, but he has to take a mouthful from each feed tub and hay pile before he shares with his best friend. He is sure that his human mom – Jean Rohland – adores him, even though, when he was younger he frequently bit her, making her arms and legs an interesting shade of blue. What's not to love about a horse who is absolutely so sure of himself, and expects you to fall in line as well? Jean Rohland is a lifelong horsewoman with a penchant for hunters. She lived and worked near Rochester, New York, but moved to Aiken five years ago with her husband Rob, and Wilbur, of course. She likes to point out that she got her horse six weeks before she married Rob. Wilbur has a very faded tattoo on his upper lip, so Jean knows he had been at some racetrack, although there is no record of his ever making a start. His official name was Good Ol Will, not exactly an inspired name for a racehorse. His pedigree was equally nondescript: His sire was a stakes-winner named Gala Harry and his dam was a lightly raced mare named Devilish Miss. The first six years of his life are veiled in mystery. When Jean first came across Wilbur he was competing in his very first jumper class, clearing the 3' 6" fences as if they were nothing – there weren’t any lower classes at that time. When the class was over, there was a line of trainers waiting to buy the 7-year-old, but fortunately for Jean, her trainers Betsy Hoppell and Stewart Moran were first in line. "They showed him in First Year Green for a year," recalls Jean. "I bought him the following year and started in the Amateur Owner division. I was really lucky to get him, but, boy, did he have some quirky habits. "He had a bad biting habit. He would swing his head around when you were braiding or tacking up and grab whatever body part he could get a hold of. I did have bruises all over my arms and legs that first year! There was one time when I was jogging him in hand and I had to keep going faster and faster because I heard his teeth gnashing behind me – not a comfortable feeling." Wilbur's saving grace was that he could jump the moon. Because of that, the pair collected ribbons galore for the seven years they competed. They were regulars on the Syracuse PHA circuit and throughout Zone 2. In 1996 and 1997 they were the Amateur Owner Hunter Champions for Zone 2. Jean was also proud of the fact that each year of competition they qualified for the National Horse Show. "Wilbur was well-known around the circuit," says Jean. "He was such a showman – he loved the crowd and the applause. The more excitement there was, the better he liked it." Wilbur was one of those horses who had to be lunged for ages before showing, and Jean figures they competed in about 20 shows a year. Whenever she thought she could get away without lunging, she came to regret it once they were in the ring. The showman act carried over to the paddock at home. "His large paddock was by a four-way stop. One minute he would be quietly grazing and the next he would be putting on a Wild West bucking show for the benefit of any stopped cars. The minute there was no traffic he would go straight back to grazing." If Wilbur was turned out in an outdoor paddock with jumps, Jean and Rob found themselves running out to take the obstacles down because Wilbur would be jumping everything – no matter the width or height – just for the fun of it. By the end of Jean's career with Wilbur she had changed trainers, working with Gail Miller of Lehman Farms in Pittsford, New York, since Betsy Hoppell had moved to Florida. Wilbur then took Gail's daughter Leslie through the Children’s and Junior divisions and continued on as a successful Children's Hunter, bringing multiple championships to several young riders. When he was 22, he was retired from the show ring and would take Jean or her friends on leisurely hacks, something he hated to do in his prime. Now Wilbur lives in Aiken, where he is enjoying the milder climate. "He was having a lot of trouble keeping weight on during those long, cold New York winters," says Jean. 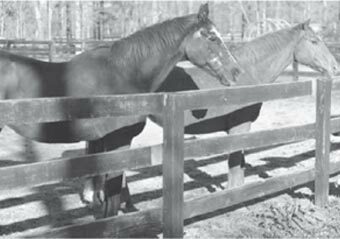 "When we got to Aiken and pulled him off the trailer he came to a dead halt when he saw all the green grass. He couldn't believe his eyes." When they first arrived in town, Jean rode Wilbur when time allowed, since she had a new horse she was competing. Then, in 2010, Wilbur started to have suspensory issues and Jean officially retired him. 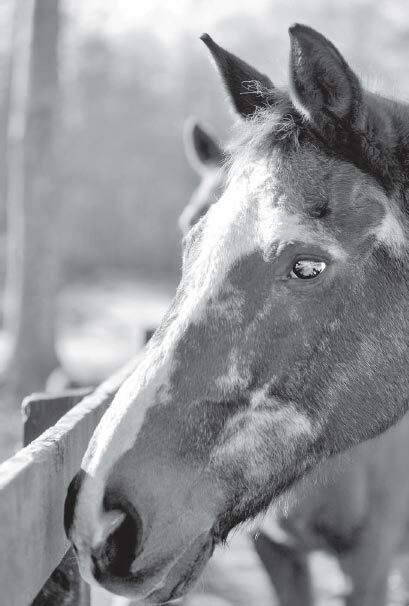 These days he lives at Dawn Sposato's Hollywood Farm and is the beloved friend of Charlie, Wendy Gutfarb's retired hunter who was profiled in the previous Secret Lives column. "Charlie and Wilbur keep each other young," laughs Dawn. "They have been together for nearly two years and it is amazing to watch them race and entertain each other." Dawn does admit, however, that Wilbur doesn't suffer fools. "He is incredibly opinionated, whether the subject is blankets or the position of the feed tubs. I am sure he thinks of me as 'staff,' and if he thinks I am out of line on any issue then he will start snapping his teeth." If Dawn feeds five minutes late, Wilbur is in an uproar, and he has to sample food from both his and Charlie's feed bucket to make sure they are both getting the exact same meal. Same goes for the hay piles – he always checks each portion of hay to make sure Charlie is not getting something tastier. Fortunately Charlie is the easy-going type. "I try to make their lives wonderful," says Dawn of her senior boarders. "They've worked hard and deserve to have a pleasurable retirement. Wilbur and Charlie are happy old horses, but they can still get silly." Recently a 2-year-old filly wandered over to Dawn’s from a neighboring farm, spending most of the night outside of Wilbur and Charlie's paddock. She had the two old geldings in such a tizzy that even when she was back home, they yearned to see her and spent hours craning their necks over the fence boards trying to catch a glimpse of her. "They didn't eat for a day or two and it took two weeks to get them back to normal," says Dawn. There's obviously a lot of life left in the two old gentleman!